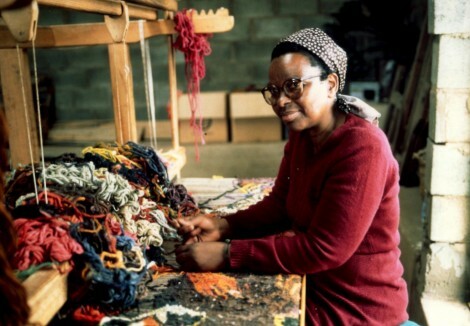 Profession/occupation: weaver, teacher and supervisor at ELC Art and Craft Centre in Rorke’s Drift. Art form/medium: tapestry weaving and knotting. Start artwork: while applying for a nurse job, she met a Swedish couple that started a workshop for patients. She discovered her talents and artistic drive. Relevant info: she built her own weaving mill in a remote settlement near Swart-Mfolozi in KwaZulu-Natal, in 1977. (Solo-) exhibitions: 1998, Allina Ndebele; de draad van het verhaal, Museum De Stadshof, Zwolle. References: Berkum, Ans van, en Jules van de Vijver; Allina Ndebele, Amsterdam (The Thami Mnyele Foundation) 1998. In her tapestries she gets in touch with her memories of the numerous Zulu folktales that spoke, through granny’s voice, of times immemorial. She uses no premeditated composition or logical storyline. Scenes get mixed up or flow into one overall vision that triggers the spirit of fantasy. The tapestries are patiently woven with the skill of her craftmanship.